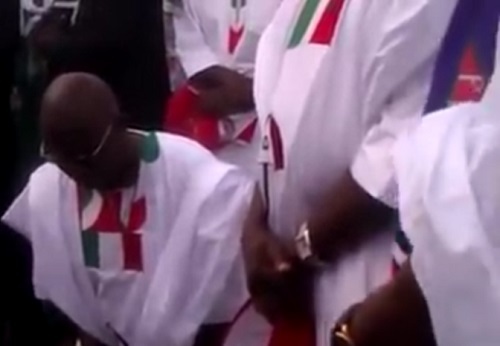 Governor Ayo Fayose of Ekiti State went on bended knees at a rally of the Peoples Democratic Party (PDP) in Ekiti, praying hard for God to help his party win election in the state this Saturday. Fayose also challenged God not to accept his prayers if his hands are not clean. In a four minutes video posted online, the Governor could be seen speaking in Yoruba language. "Father Lord, think and consider all who are hungry, consider the sufferings of my people. Even if it is because of them only, I pray unto you today, let our wish be fulfilled. Let me be honoured today. I must not be put to shame… Some put their trust in chariots, some in their powers, you are my witness today Lord, if I have ever called on any other apart from you, do not let my prayers be answered. "But since you are the only one I call on, I put my trust in you today because you are my salvation. Lord, conquer my enemies today! All the eyes looking at us, all hearts I meet today, everybody that will talk today, let them have mercy on me. “You said in your words that I will possess all the lands I step on, today Lord, let me possess this land. Like you did for Joseph in the land of Egypt… So that I can govern my people. You are the mighty one in battle. Let all the attacks and distractions of all the members of APC be a thing of the past. I tie them, I bind them, I conquer them because it is not by my power but by the Lord. "All the ammunition you brought, I turn it to nought. All help for you will end in futility. Today, when I return, let my people have cause to praise you. I ask for honour that nobody has ever enjoyed, today, let me be favoured! "I kneel before you, today, let me be honoured, double my help. Help me Lord. "I run after them, overtake them and grab what belongs to me in Jesus name."